Hi loves! After a few days in North Carolina, I'm finally back in (very snowy, not so spring-y) Minneapolis. 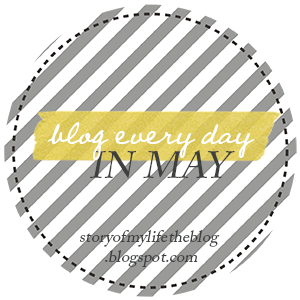 And what better way to celebrate a new month than with a new challenge - like blogging every day in May! My lovely blogger friend Sarah at Run Shop Eat Repeat introduced me to the Blog Every Day in May challenge featured on the blog Story of My Life. I have yet to do one of these monthly blogging challenges, but really couldn't resist this one. I don't usually have trouble coming up with content for Twentyapolis, but what I do struggle with is time. Some days, it's hard for me to find an hour or two to sit down, relax and write. In my opinion, posting quality content every few days is better than writing mediocre posts every single day. BUT, with that being said, I think this challenge will be good for me. The topics are fantastic. Let me repeat. Fantastic. I can already tell that they'll prompt me to dig deep and write about things I haven't blogged about before. It will be a great way for you to learn a little bit more about me, and for me to learn more about you! With that said, as you can see, IT'S MAY 3. I am already failing. Thankfully, I know you all won't judge me for being a few days late due to that work trip! So here we go - blogging every day in May!